Hey All and Happy Monday to ya! Hope your weekend was wonderful. I can't wait to see what you all have been up to. 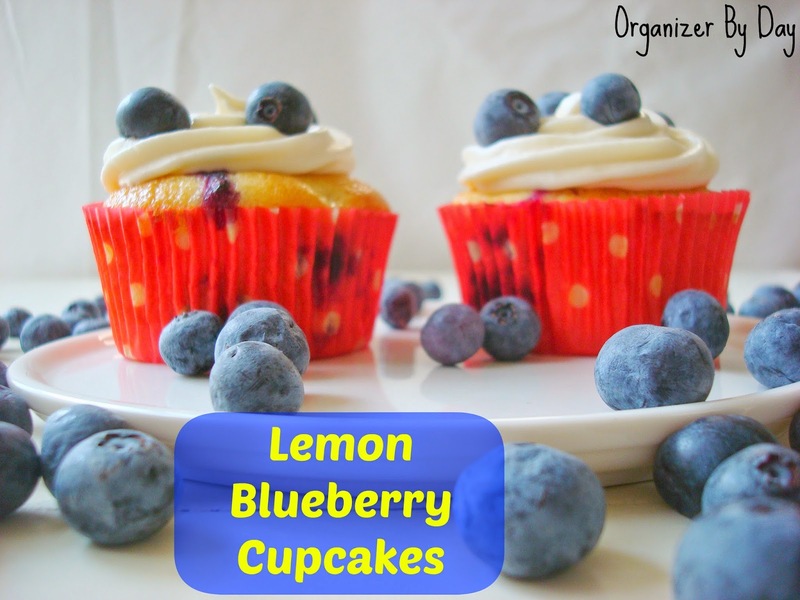 But before we get to our fabulous party, I wanted to share my newest cupcake creation: Lemon Blueberry Cupcakes! Hope you love them as much as I did! Now on to this awesome link party! Show me what you got! Alycia chose Marriage After Baby: How To Keep The Spark from All of Life's Little Adventures. "I love this post by Tawnya because as a fairly new wife (3.5 years) and a new mama, I sometimes struggle with remembering to equally balance the two. Remembering that you were partners first and parents second is important. Keeping the spark alive will foster the growth of your family. She shares some great tips and great insight!" Karen chose Lovely Floral Garland from Designs by Miss Mandee. "Not only is this garland great, but you can make your own with the download option! Plus, the images can be used for so many other things, making it a versatile freebie." Ashley chose The Style Friendly Man Chair Compromise from Bless'er House. "Lauren from Bless'er House was on the hunt for a Style Friendly Man Chair that would be a compromise between her desire for clean lines and her hubby's need for ultimate comfort. After tons of research, you won't believe what she found!" Victoria chose 6 Reasons Mom Lose Their Joy from Fruitful Families. "I chose this blog post because I can actually relate to what this blogger talks about. When you become a mom, you do love your kids but there are times when you lose your joy. I loved how this blogger kept it real in her post." Katie chose Prisma Wall Decor : Knock Off from Delineate Your Dwelling. "I am a sucker for a good knock off, and this one is FABULOUS ... And basically FREE! How's that for a good combo?! Amy made this out of ... Paper Straws and Bakers Twine (plus some gold spray paint)!! I just live the result!! Beautiful!" Katy chose How to Tell If Your Daughter is a "Mean Girl" from Barbie Bieber and Beyond - Raising Girls. "My daughter, Emily, writes on my blog about her experiences being bullied and admittedly, the resources available to those being bullied far outweigh the resources available to those doing the bullying. Encouraging parents to pay attention and consider whether or not their child is headed in the wrong direction and how to get them back on track is an important piece to the #stopbullying puzzle, and I appreciate her bringing it to light. It's hard to admit as parents that our child might be a bully, but we have to be open to addressing these issues instead of ignoring them." Jillian chose Finding inspiration in the face of writers block from Operation Home. "I chose this blog because as writers we have all suffered with writer's block at one point or another, having these tips handy can help you overcome that block." Natasha also chose this post. "These are some great tips to overcome writer's block. Since I've had my fair share this year, it is great to have a way to get through it." Elie chose Trix Krispie Treats from MadeInADay.com. "These Trix Krispie Treats from Kim at Made In A Day look so delicious!! I wish I would've thought of these! Can't wait to try them myself." Tenns chose Efficient Blogging from Pastries, Pumps, and Pi. "Such a great rundown of how to blog more efficiently! I think any blogging can appreciate and benefit from Tameka’s post. Its will thought out and thorough, and most importantly resourceful." Stacey also chose this post. "What a wonderful post! I, too, have several things that I would like to bring into my blogging...such as having more guest posts as well as becoming more frequent with posting and scheduling, and adding a few more things that I have learned from more seasoned bloggers to make my site better for my readers. Thank you so much for sharing!" Silvie chose Cherry Mint Water and More Infused Water Recipes from Little House Living. "I chose this post as my favorite because ever since I started my weight loss journey I've been using infused water to get past that bland taste in plain water and be able to drink more of it. After trying it I found that Merissa's Cherry Mint infused water recipe is easy, and delicious!" Jessica also chose this post. "I've always been a fan of infused water recipes since working at a casino in Las Vegas. Our spas always had them on hand for the guests and I, of couse, always wanted to drink them because they were so good and healthy for you! Merissa's post brought back those yummy memories and included some recipes I will actually use today. Thanks for sharing!" Rhonda chose Vintage Wrought Iron Table and Chairs Redo from GrandParents Plus. "I love repurposing things. This blogger did a great with this make-over. The fabric selection makes the red and white pop, and it's now a great spot to enjoy family and a beautiful view." Rachel chose 8 Tips for better summer photos of your kids! Photos of Summer Friday, week 6 from Just A Touch of Crazy. "I chose this post because I feel like my son is growing up so fast and I want to capture all the fun and memories of childhood, especially summer. These tips are great for making those moments into beautiful memories." The post with the most clicks is 5 things that will INSTANTLY help your blog... from After Eleven.